This dairy-free, oil-free soup is heavy on flavor without being heavy in fat. If you like a lot of spice, include the jalapeño seeds; otherwise leave them out. In large pot, saute onion until soft, adding small amounts of broth or water as it sticks. Add squash, potato and vegetable broth to pot, bring to a boil, and lower heat to simmer partially covered about 20 minutes or until squash and potatoes are soft. Transfer soup to blender along with non-dairy milk and blend until smooth. Pour blended soup back into pot, heat until warmed through if it cooled off from milk, season with salt and pepper. Serve and drizzle with a tiny bit of truffle oil if desired. 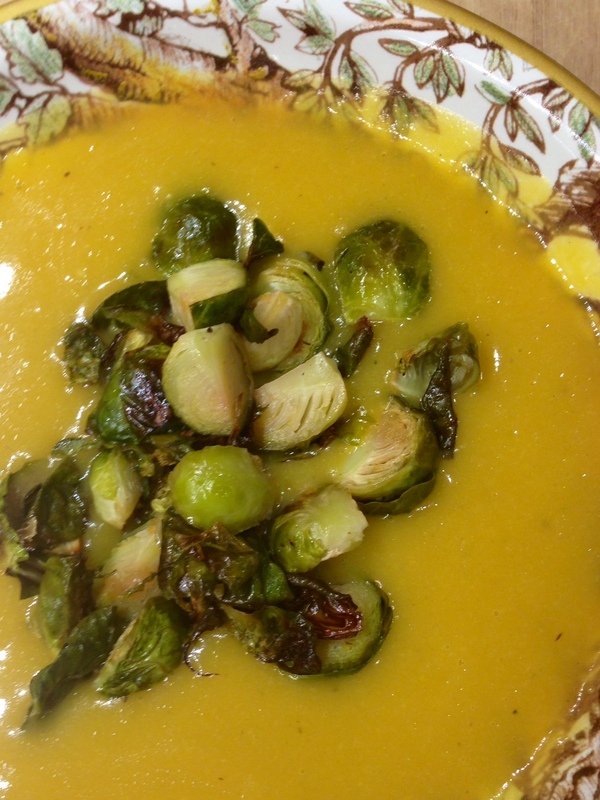 This soup is delicious with the Lemon-Maple Brussels Sprouts (click link in blog entry above, or find in Recipes). This entry was posted in Blog, Recipes and tagged butternut squash, dairy-free, gluten-free, low-fat, oil-free, soup, vegan by Shelly Detken. Bookmark the permalink.